Are you ever embarrassed by your dog’s behavior? Imagine you’re out for a pleasant stroll with your dog. The sun is shining, your furry companion is trotting by your side, blissfully sniffing the breeze and occasionally stopping to leave pee-mail. This is how you imagined it would be to have a dog in your life, comfortable companionship, a partner in leisurely activities. All is well with the world. Except… you’re not as relaxed as you’d like to be, because instead of enjoying the scenery, you’ve got to constantly scan the horizon for ogres. You are on the lookout for things that might excite or upset your dog. The offending specters could be skateboarders, cyclists, strangers, small children, or even other dogs. No matter the offender, the reaction and outcome is the same. Your dog loses all focus: wines, barks, lunges, and spins! You’ve lost control and your dog acts as though she’s lost her mind. It’s all you can do to hold on to her leash. Forget feigning nonchalance, you are focusing on not toppling over. We’ve all seen it, if not been there. When your dog is reactive, fearful, or aggressive out in public (or anytime, really) it’s incredibly stressful at both ends of the leash. Ongoing leash-reactivity will certainly cause you to take your dog out in public less and less, which not only exacerbates the problem when you do venture out, but also can cause a breakdown in your relationship with your dog. Many training protocols for dealing with fear or frustration are either unpleasant, or simply unreasonably difficult and too drawn out to execute with any success. That is where BAT comes in. 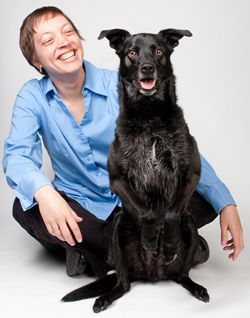 Thanks to her dog Peanut, who proved to be a particularly tough nut to crack behaviorally, Grisha Stewart, creator of BAT and the founder of Ahimsa Dog Training has designed a behavior modification protocol to rehabilitate dogs with reactivity issues, as well as a prevention plan to keep reactivity from developing in puppies. Your dog’s behavior is a mirror for her emotions. The premise of BAT is to keep dogs (and their humans!) as stress-free as possible while teaching people to read (and honor) the subtle body language cues that their dog is stressed while simultaneously giving dogs the tools to make good choices that ultimately reduce their stress. It sounds like quite a task, but the beauty of BAT is the way it is broken-down and presented for both dogs and humans alike. However, the best thing about BAT is you are not alone. Grisha has developed an abundance of resources to help you navigate your journey. Her website FunctionalRewards.com is packed with information and materials such as her book, DVDs, and even a Yahoo! group for support. Grisha is also making the rounds, traveling worldwide teaching people how better to communicate kinder, gentler options for their fearful and reactive dogs. Check her event listings to find out when she’ll be in your neck of the woods. In the interview below Grisha and I chat in detail about what BAT is, what is takes to become a BAT-itioner, and why it’s sweeping the world of dog training. Please join us by tuning in to our conversation below. This entry was posted in Kelly Gorman Dunbar, Training and Behavior and tagged behavior adjustment training, training and behavior on September 19, 2011 by Kelly Gorman Dunbar. I feel like the introduction was describing me and my stranger reactive dog. I also very much enjoyed the question about what to do on a walk. I watched the BAT full-day seminar last week and truly believe it will work and help us. Now time for some set-ups of our own! Hopefully I'll have a success-story to share in the near future. I do know of someone using BAT with a blind dog. The idea was the same, except instead of looking at the other dog, it's by smell. So you're still looking for an engage/disengage pattern to reinforce, but it's via smell instead of looking. I wonder if your techniques will work with blind dogs. I have a 9 year old blind pit mix. He loves his "sister," but does not do well around most other dogs. That's procedural difference, but here's another. Classical CC/DS is associational learning procedure, it's about making a positive association between the trigger and something the dog likes, say food. So the trigger means something good will happen to the dog and that works very well in many cases, particularly with audio triggers. BAT is about teaching dogs how to self-soothe and gathering information is part of that. So the dog learns to observe the trigger and learn that in and of itself, it is not dangerous, but actually interesting and fun. So it's the difference between: "kids mean good things happen to me (usually from mom)" and "kids are safe and fun - and if they ever do scare me, I can just go away." Oh goodness, I'm so glad I came across this on Twitter. Our amazing border collie isn't always so amazing when he's stressed out or scared, and so far we've had no luck re-training his responses. I'm definitely going to bookmark this - my partner and I are currently traveling fulltime so our dog is staying with family, but as soon as we settle down and get home I plan to tackle this issue head-on with the BAT technique. Hope it works!! This is not at all the same as classical CC/DS. It's an operant protocol where we are looking for particular behaviors that the dog does and reinforcing them with a 'functional reward' - usually walking away from the trigger. They don't want to walk away if you're too close, so you have to work below threshold. That part is the same as with CC/DS. Some stages of BAT do use food, but it's still not in the open bar / close bar way as classical CC. There's a YouTube video on the homepage of http://functionalrewards.com that might make what I said more clear. I also do a side by side comparison between BAT and other methods in the two-day seminar. We just filmed the one in Chicago and that will be available as a Tawzer video soon. I'm wondering how BAT is different than the Desensitization & Countercounditioning protocol trainers have already been using? Is this a repackaging for the general public? Thanks!